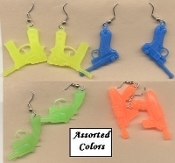 Mini funky FAUX SQUIRT WATER PISTOL SPACE GUN EARRINGS - Vintage Retro Punk Replica Miniature Plastic Toy Jewelry - ONE (1) PAIR, chosen from assorted bright hot neon colors. Shown are representative of selection of many more, not pictured. Colorful miniature game gumball prize charms, approx. 1-inch (2.5cm) Long.